melting – Is It Getting Warmer? Boone Pickens and Ted Turner are well respected businessmen (the former a big investor and the latter a media mogul and founder of CNN). Both have a history of speaking their mind on public issues and both have a history of making huge sums of money. 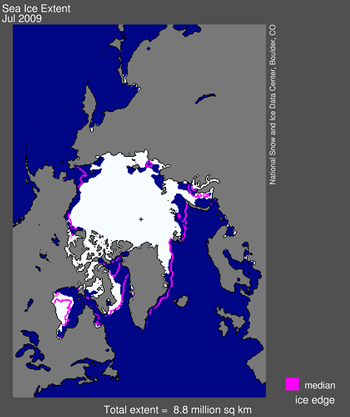 AccuWeather.com has an excellent update on the status of the Arctic ice last month – July 2009. Looks like the melting was pretty bad. And here is an image from NSIDC (National Science and Ice Data Center) showing the current ice coverage and the median. I originally found this opinion in “The Detroit News” and so you can click through and read the entire article. I really cannot explain this topic better than Mr. Taylor and I suggest that you read my highlights here and then read the full article if it is interesting to you. Is it too cold outside to have global warming? There has been some talk in the press and on some of the blogs that it is too cold in the last couple years to have a global warming trend.� Some even say that the warming trend is reversed and it is now going to get colder.� There are a variety of people that discuss that the ice caps are re-freezing after having melted which signals that global warming is reversing. Some talk of a local low record that was set at some airport.